Umm not quite. Maybe a stairway to a sanctuary. Or better yet stairway to the front door. 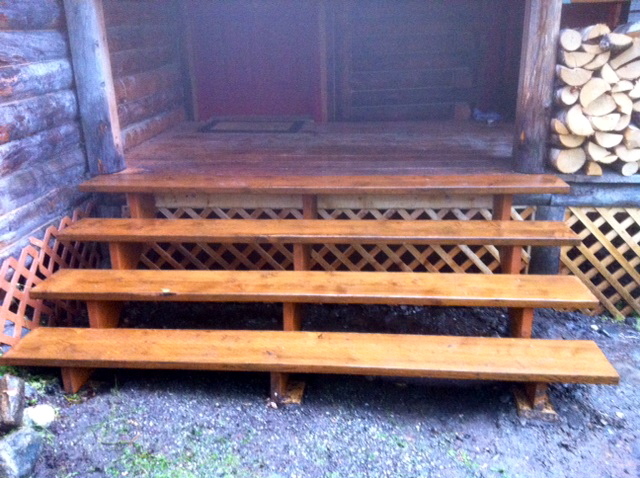 This weekend, my son, Tyler and I finished the front steps on Fortos’ Fort. It was a project that I have wanted to do since the day I moved in over a year ago. Like all projects, this is one with a story. It started late Friday night. It was about 9 pm and still enough daylight out that it looked like it was mid afternoon in the lower 48. We hooked up the old stairs to the my Toyota Tundra truck using a couple tie down straps and Tyler jumped in the cab and gave it a pull. The old stairs pulled out without much of a fuss and we got started on the project. The first step was to install a backer board to the log beams that made up the porch. Of course this was not easy being that the log had plenty of knots. We finally got the board attached using the 1X6 and secured it with 1/2 inch lag bolts. With the backer board installed the next step was installing the risers. The hardest part in doing this was making sure they were level. Tyler spent about 45 minutes digging holes and leveling the ground before we installed the risers. After attaching the risers to the brackets and making sure everything was level we dry fitted the treads for the first time. Something didn’t look quite right. We had planned to use 2X8’s for the treads but when you went to use the steps just felt wrong. It was now after 10 pm (and plenty of light to work) but we needed to call in the reinforcements. It was my father-in-law, Ed. If you are a rabid reader of this blog you know that Ed is the Mr. Fix it of all handymen. He has taught me everything I needed to know about home repair and hand tools. Tyler got his grandpa (Ed) on the phone. Never-mind it was after midnight in Colorado, where he lives and after a 2300 mile discussion we realized that we put the risers on upside down! Yep, that’s right. I a sure you are laughing as you read this. I really don’t care. Honest mistake. Yeah right. It was a mistake that took almost an hour to even realize. After figuring out what we had done and hanging up with our phone support we took the whole thing down and called it a night. That is after realizing that we needed the four stair riser set versus the two step ones we had on hand. We bought new risers, new treads–2x10s this time, a box of screws and even picked up a new grill that was on sale for $169.00 (regular price $212.00). They were practically flying off the shelves at that price. A couple hundred bucks poorer we headed home. Tyler and I got to work of digging, leveling and securing the new risers. Not fifteen minutes after the triumphant high five and patting each other on the back for a job well done I realized that the 2x10s were not going to cut it. The treads needed to be 2x12s! After kicking a couple of rocks around the yard in disgust I loaded up the truck and headed back to Lowe’s. Another 80 mile trip. Good thing it was only 4 pm. I returned the 2×10’s and some 2×6’s that we didn’t need and bought four 2×12’s after going through nearly 20 of them to find the best ones that were not warped, split or full of knots. By the time I got back to the house it was pouring rain and I have been fighting a nasty head cold for the last couple days. But this project had to be finished. We couldn’t get in the house otherwise, unless we jumped on the porch or walked around back to the deck. So three hours later in the pouring rain we finally got the stairs done! I may have pneumonia in the morning but at least we have one more project to check off the ever growing honey do list. I am proud of the work that Tyler and I did. I think they look pretty dang good. Well, at least ten times better thanthe old ones. I have said it before, and I will say it again, that they (we) do things different in Alaska. 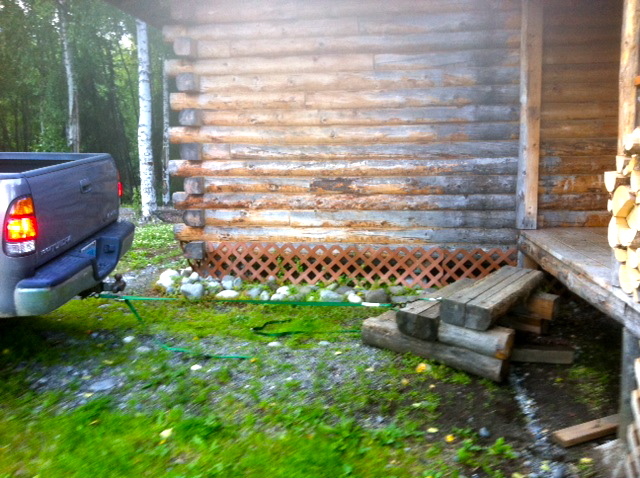 Not many people would be outside with power tools, electricity, and sloshing around in the mud in the pouring rain. We do here. It is part of every day life up here in the Great White North. Did you happen to catch that episode of Sarah Palin’s Alaska where she went on a camping trip with that lady from the show 8 Plus Kate? If you did, you know exactly what I am talking about. Next, up? Tyler’s got a grill to build! Never a dull moment around the Fort.